Posted February 6, 2019 at 2:10 am . 2 comments. Today’s B&H DealZone (one-day deal) features two great deals — on the Tokina AT-X 116 PRO DX-II 11-16mm f/2.8 and the Think Tank Retrospective 10 Shoulder Bag. 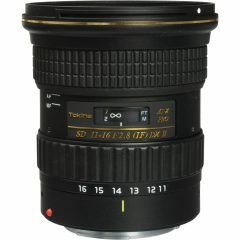 That Tokina lens is one that is often recommended for astro shooting on crop sensor cameras. The wide angle of view combines with the fast F2.8 aperture quite well for long night time exposures. I have used the Samyang/Rokinon 10mm F2.8 for the same purpose, and it works well too, but is full manual, even for exposure (all irrelevant for night shooting). If you intend to have a lens for more than just night shooting, the Tokina is a good choice for this price, as it has AF and AE functions. is there a code to make the lens 329?